ThinkFree Online is the best online office suite available, and it’s FREE to users for editing, creating, and sharing Microsoft Office format documents (Word, Excel, PowerPoint) without buying any software. 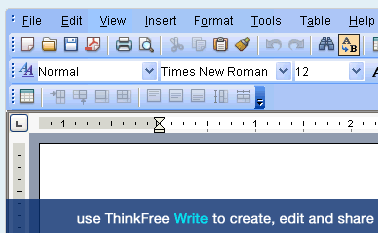 The online suite of applications consists of ThinkFree Write (word processing); ThinkFree Calc (spreadsheet); and ThinkFree Show (presentation software) that you can use anytime, anywhere on any connected computer. This free word processing, spreadsheet and presentation applications are integrated with 1GB of storage, collaboration tools, publishing to blogs, web pages or Doc Exchange (our library of published files), and PDF creation. These applications use the same formats as Word, Excel, and PowerPoint® (.doc, . xls, .ppt ), and the interface looks, feels, and behaves just like Microsoft Office, eliminating the learning curve. The only difference is it runs within a browser. You no longer have to worry about losing your files again. You can store and access all your documents in our secure storage server without the hassle of backing it up..
With ThinkFree collaboration tools, you can easily share your ideas and work with others. You can give others permission to work on your files and let them contribute their ideas to your work. There is no need to worry about compatibility with your system. ThinkFree Online supports all major desktop operating systems including Windows, Mac OS X, and Linux. You can edit and view documents in 11 languages. Languages that are fully integrated are English, Spanish, Italian, German, French, Chinese, and Japanese. Support for more languages is under development along with translated menus, dialog boxes, and user guides.